Its funny how of the literally hundreds of potential customers we see every year, many people ask a lot of the same questions…. And one we always get is….. I would say that more than 80 percent of people live through it, although some probably wish they had moved out! If we are putting on a second storey, people almost always live through the renovation. This is largely because our building method for inserts or a new second storey is to scaffold the house, put in a ramp with ALL of the work then being done via external access, even the painting and tiling. 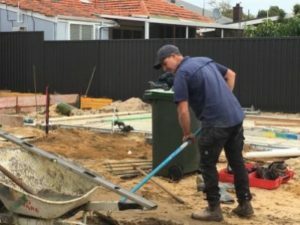 The very last thing that goes in is the stairwell and so the to live downstairs while all that happens, apart from dust, noise and sharing your property with tradies, the process goes really smoothly, even with young children. Where we do normally suggest that you move out is when the renovations are contained to a single storey dwelling and key areas like kitchen and bathrooms are out of action for some or all of the renovation. …a 4 to now 8 months pregnant lady, her two children and her husband have just survived with only two bedrooms, a laundry and a bathroom for 4 months while we have completed their renovation in Padbury…..and they are wrapped with the result! Our team even used to sweep the steep driveway for her every night before she came home. These days there are portable bathrooms complete with flushing toilets and hot water that can be hired and parked in the driveway….with cooking done on a BBQ or a lot of eating out occurring!! 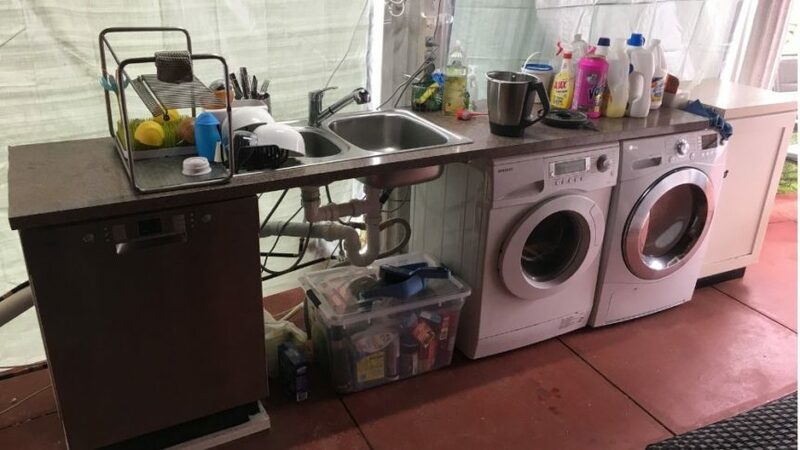 The temporary kitchen and laundry in the photo at the start of this blog was rigged up by our team for a couple and their child in North Perth on their front verandah. It has proved a big hit, complete with dishwasher. washer and dryer and hot and cold running water to the sink! …whether that be to a second property, with the in-laws, house sit or whatever, the job will be finished quicker for a more competitive price and you will enjoy the process much more from afar than being right amongst. We are happy to work with you when it comes to this decision. It is just another one of the added benefits of working with a small company like ours with young Directors who are hands on throughout the project from the moment you commit to our company. For examples of some of our most recent renovations, please head to the Before and After section of our website.